PLEASE be sure your pooch is on a 4-6' leash (no long Flexi-Leads!) before exiting your vehicle to walk to the Daycare Center located behind the house at the end of driveway. If your dog does their "business" in route, please bag and deposit into the bucket near the Daycare. Please schedule your dog's Pre-Screen evaluation when you are able to leave your children in another's care for their 60+ minute evaluation. 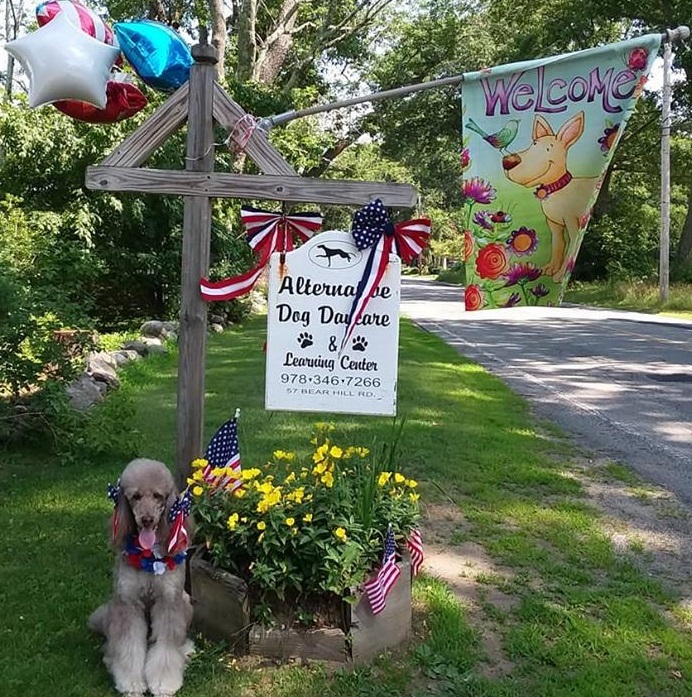 Please do not arrive early for your Pre-Screen appointment, not only does it disturb the Daycare dog's daily schedule, it also effects a portion of your dog's evaluation. Your dog is being monitored the moment they exit your vehicle and is part of their evaluation. **Please do not drive past the orange cones in the driveway, doing so will disturb our dogs in the house and also alerts the daycare dog's to start barking. Follow RT 110 West Through Amesbury into Merrimac, MA. passing the Merrimac Liquors Store on your left. Continue on 110 West. Just after SKIPS BURGERS, Take a RIGHT onto BEAR HILL RD. Follow BEAR HILL RD for 1 mile to # 57 BEAR HILL on your RIGHT. Follow RT 110 EAST through Haverhill into Merrimac, MA. passing the Merrimac Fire & Police Dept. on your LEFT. Continue on 110 East for 0.5 mile. Just after the OLD OAK & AL'S AUTO take a LEFT onto BEAR HILL Rd. Take 495 SOUTH, to Exit 53 (MerrimacPort / Broad St Exit) take a RIGHT onto BROAD ST at the end of off-ramp. 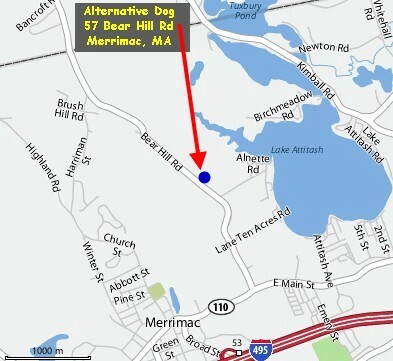 Follow Broad St. 0.6 mile to the Merrimac Fire & Police Dept. in front of you. Take a RIGHT onto RT 110 East. Bear RIGHT off the ramp. Follow RT 110 WEST to the first set of lights at the BURGER KING. *IF coming from from RT 110 WEST: Just past SKIPS BURGERS, take RIGHT onto BEAR HILL RD. Take 495 NORTH, to Exit 53 (MerrimacPort / Broad St Exit) take a LEFT onto BROAD ST at the end of off-ramp. Bear LEFT off the ramp. Follow RT 110 WEST to the first set of lights at the BURGER KING. *IF coming from from RT 110 WEST: Just past SKIPS BURGERS, take a RIGHT onto BEAR HILL RD. You can use Google map above for directions as well.